Since FDI and trade are both handmaidens of growth and development, it is important to understand the interlinkages between the two. The role of trade as a positive factor in growth and development has long been recognized and reflected in trade policies. Foreign direct investment, as the principal method of delivering goods and services to foreign markets and the principal factor in the organization of international production, increasingly influences the size, direction and composition of world trade, as do FDI policies. The role of FDI as a positive factor in growth and development is being increasingly appreciated and is also increasingly reflected in FDI policies. Trade and trade policies can exert various influences on the size, direction and composition of FDI flows. Apart from the autonomous impacts of each on growth and development, interlinkages between trade and FDI must be taken into account if the developmental contribution of each is to be maximized, and if synergies between the two and broader growth and development objectives are to be maximized. These considerations provide good reasons for looking more closely at the nature of the interlinkages between FDI and trade. Another reason is that national FDI and trade policies are generally formulated independently of each other, with the result that the two sets of policies may not always fully support one another in policy objectives and their efficient implementation. An improved understanding of the interlinkages can contribute to the formulation of national policies in the two areas that are mutually supportive. And, of course, it would also provide a background and basis for discussions at the international level as regards appropriate policy arrangements. Historically, the relationship between FDI and trade for a given product has been characterized by a linear, step-by-step sequential process of internationalization, running from trade to FDI or from FDI to trade. In manufacturing, market-seeking firms typically begin with domestic production and sales. They internationalize via exports, licensing and other contractual arrangements and by establishing foreign trading affiliates before they engage in FDI. 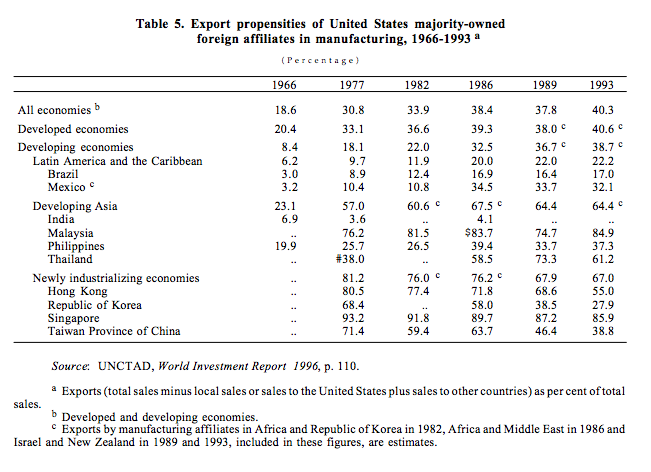 As a result of this linear sequence, FDI in manufacturing is often viewed as an activity replacing trade. This perception has been strengthened, moreover, by the notion of a product cycle in which FDI takes place only when an innovating firm no longer finds exporting as profitable as producing abroad. This sequence of trade leading to FDI characterizes internationalization that is motivated by the search for markets, traditionally the dominant factor motivating TNCs. Manufacturing firms that seek low-cost inputs (especially labour), as part of their effort to improve efficiency and corporate performance may, however, begin their internationalization sequence with FDI, and this is trade creating. The dominant characteristic of the relationship between trade and FDI in the natural resources sector is also a linear progression from one to another. It begins either with imports, followed by FDI from the importing country in a process of vertical integration that may well lead to higher exports from the host country, or it begins with resource-seeking firms undertaking FDI and proceeding to export from host countries. The latter, common in non-renewable resources, accounts for most natural resource investments. In both cases, FDI is typically trade-creating, leading to exports or additional exports from the host country. In the services sector, the dominant characteristic is that trade as an option to deliver many services abroad does not exist, and firms must move directly to foreign production if they want to satisfy international market demand. As a result, service firms do not enjoy the comfort of a gradual conquest of foreign markets through a linear sequential approach: the linear sequence is truncated. The need for local presence to deliver services is one reason underlying the shift of the world FDI stock towards services in the past 20 years. Establishing affiliates abroad has, in general, a smaller direct impact on home country exports of the service in question than establishing market-seeking manufacturing affiliates has on trade in a product. The situation as regards FDI and trade in services is beginning to change under the impact of the growing transportability of services, and especially that of information-intensive services, or parts thereof, due to advances in telecommunications and information technologies. This may reduce the need for FDI to deliver these services to foreign markets. The technological advances that have increased tradability have also opened up possibilities for export-oriented FDI in some services or as regards particular services functions undertaken typically in-house by various firms (e.g., data processing, accounting). Apart from product-specific FDI and trade impacts of sequential trade-FDI interlinkages, there are also impacts from associated trade and associated FDI. The former include, for example, additions to exports of the home country due to intra-firm sales of services and intangible assets by parent firms to foreign affiliates, whether in manufacturing, natural resources or services. They also include additions to home country exports due to intra-firm sales of machinery and intermediate products by parent firms to their foreign affiliates. Similar exports from the parent firm occur in low cost inputseeking manufacturing FDI and in natural resource FDI. In addition, there could be further effects on trade due to exports by other firms in the same or other industries (or even sectors) of goods and services required by foreign affiliates. Foreign affiliates in the services sector may also have an indirect impact on trade, as they may create demand for machinery and equipment necessary and/or for information-intensive support services provided either by headquarters personnel or services provided via communication lines. But again, this impact is not large. The exception is FDI in trading services, which plays a substantial role in facilitating the exports of goods from home or host countries, or both. The internationalization sequence in a given product also gives rise to associated FDI. This begins when, for example, a firm exporting a manufactured product establishes marketing or other affiliates abroad; it continues when other firms (e.g., component suppliers, advertising firms, banks, insurance companies) follow suit once an investment in a particular product has been made. In natural resources, associated FDI can take place where certain services are required (e.g., shipping) or where foreign firms move into processing. Investment in a service may lead to the establishment of foreign affiliates in related services. More importantly, FDI in trading services can give rise to associated FDI in the production of manufactured and primary products by the same TNC or other TNCs. …and implications for countries’ trade. The overall impact of market-seeking direct investment on the volume and composition of trade of a home or host country at the industry or aggregate level depends on the relative importance of these various direct and indirect effects. In general, FDI that follows trade can replace trade in a single product, but it is unlikely to do so — and, in fact, is often complementary to trade — at the sectoral and national levels. Some empirical studies suggest, indeed, that the trade-creating effect of FDI in manufacturing tends to outweigh the trade-replacing effect for the home country. Moreover, FDI seems to shift the composition of home country exports to host countries towards intermediate products and away from final products. In natural resources, the impact of the FDI trade linkage was, and still is, trade creating. For one thing, host country exports of the resources involved expand. So do, generally, home country imports of the same resources and, also often, home country net exports due to increased exports of the resources after processing, or of manufactured goods based on these resources. The principal issues regarding this FDI-trade interlinkage relate to the retained value (or share of rents) accruing from the exploitation of, and trade in, host country resources and the role that these resources can (or should) play in development. Many countries had severed the FDI-trade linkage through nationalizations, in the expectation that they could capture a larger share of the rents and promote domestic development more effectively. More recently, a new relationship appears to have emerged in which many countries benefit from trade, technology and skill assets that TNCs possess, and firms benefit from stable supplies, without necessarily risking their capital. Still, TNCs account for a fair share of the raw material trade of host countries. In 1992, United States affiliates alone accounted for one tenth of all raw material exported from both developed and developing host countries. This share is double that in the mid-1960s for all developed countries, and half that for developing countries. Since the links between FDI and trade in services are limited, the effects of FDI on host developing countries are largely independent from, rather than intertwined with, those of trade. As the tradability of some services increases, however, host countries, including developing countries, are able to participate more in the production and export of these services. This might however, be accompanied by reduced technology transfer and skills development, as compared with the levels that TNCs traditionally have had to undertake for stand-alone service affiliates to function effectively. Although the distinct characteristics of the FDI-trade relationship in the three sectors make it easier to understand the interlinkages between FDI and trade, the intersectoral nature of interlinkages in reality must be emphasized. Many firms not only perform various activities but produce both good and services, so that classifying them sectorally is an oversimplification. Moreover, associated trade and associated investment effects of internationalization through trade on FDI are often intersectoral. The crossing of sectoral boundaries, both in the framework of a single firm’s activities and as regards indirect FDI and trade effects, makes it increasingly difficult to isolate separate trade and investment effects associated with the internationalization sequence of a particular product, firm or, indeed, industry or sector. But what seems to be clear is that, first, trade eventually leads to FDI; and, second, on balance FDI leads to more trade. The result, therefore, is an intensification of international economic interactions. The linear interrelationship between trade and investment continues to characterize a good part of FDI. But something new is happening. In the past 30 years or so, and particularly since the mid- 1980s, the environment for FDI and trade has changed significantly. The most important changes relate to the reduction of technological and policy-related barriers to the movement of goods, services, capital, professional and skilled workers, and firms. More specifically, technological developments have greatly enhanced the ease with which goods, services, intangible assets and people can be transported, and tasks related to the organization and management of firms implemented over distances. The liberalization of rules and regulations governing trade, investment and technology flows has meant that the new possibilities created by technology can actually be realized. As a result, international production has grown substantially, as many firms have become TNCs. For example, the number of parent firms headquartered in 15 major developed home countries nearly quadrupled between 1968/1969 and 1993, from 7,000 to 27,000. Thus, there is a substantial presence of foreign affiliates in the world economy today. While most are largely stand-alone affiliates, more are being drawn into closer interaction with each other. The principal effect of the new environment is that firms are freer to choose how to serve foreign markets: by producing at home and exporting, by producing in a foreign country for local sale, or by producing in a foreign country for export. They also have greater freedom to obtain foreign resources and inputs for production by importing them from foreign producers or by establishing production facilities that enable them to access resources where they are located, for producing raw, intermediate or final products for use elsewhere or sale in national, regional or global markets. With competition driving firms to use the new possibilities to an increasing extent, more firms, especially in technologically sophisticated industries, immediately look at regional or world markets. Established TNCs in manufacturing and services in particular, can jump over the earlier steps directly to the FDI stage. Moreover, the internationalization sequence leading to FDI can begin anywhere within a TNC system — innovation, the production of a new good and export can start in a foreign affiliate rather than the parent firm. But the changes brought about by the new environment go further. As firms seize new regional and global opportunities, they combine ownership advantages with the locational advantages of host countries, and so strengthen their own competitive positions. With this purpose in view, firms — particularly those that are already TNCs — are increasingly organizing or reorganizing their crossborder production activities in an efficiency-oriented, integrated fashion, capitalizing on the tangible and intangible assets available throughout the corporate system. In the resulting international division of labour within firms, any part of the value-added chain can be located wherever it contributes most to a company’s overall performance. As a result, the simple, sequential relationship characteristic of TNCs in manufacturing gives way to a more complex relationship, in which intra-firm trade flows between parent firms and affiliates and among affiliates assume considerable and increasing importance. This is reflected, for example, in the increase in the share of intra-firm trade in total trade of United States TNC parent firms, as well as foreign affiliates, in 1983-1993. The high share of affiliate-to-affiliate trade in intrafirm trade by United States affiliates, and its growth, particularly in developing countries, is also striking. The share of exports to other foreign affiliates in intra-firm exports of foreign affiliates rose from 37 per cent in 1977 to 53 per cent in 1983 and to 60 per cent in 1993. A greater division of labour within TNCs, through either horizontal or vertical integration of activities dispersed among different locations, necessarily increases intra-firm investment and trade flows. Moreover, since the trade flows generated by integrated international production systems are related to the vertical or horizontal integration of production activities (or both), the structure of trade linked to such FDI involves relatively larger shares of intermediate products and services and intra-industry trade. Nowhere can the difference that the new environment can make with respect to FDI-trade interlinkages be seen more clearly than in the European Union and in the contrasting experiences of Asia and Latin America. In the European Union, the share of exports relative to sales of United States affiliates to other (mostly European Union) destinations increased noticeably as a result of the restructuring of TNC activities to take advantage of European integration, from 14 per cent in 1957 to 31 per cent in 1993. In East and South-East Asia, export propensities of United States affiliates have been high since the 1960s, reflecting the integration of the former into the global division of labour by United States TNCs in electronics and other industries. In contrast, export propensities of United States affiliates in Latin America were traditionally much lower. However, when countries in this region began to liberalize their trade policies in the mid-1980s, export propensities rose faster than those in Asia (table 5). … within which FDI and trade flows are determined simultaneously. The decision to locate any part of the value-added chain wherever it is best for a firm — be it transnational or national — to convert global inputs into outputs for global markets means that FDI and trade flows are determined simultaneously. They are both immediate consequences of the same locational decision. As a result, the issue is no longer whether trade leads to FDI or FDI to trade; whether FDI substitutes for trade or trade substitutes for FDI; or whether they complement each other. Rather, it is: how do firms access resources — wherever they are located — in the interest of organizing production as profitably as possible for the national, regional or global markets they wish to serve? In other words, the issue becomes: where do firms locate their value-added activities? In these circumstances, the decision where to locate is a decision where to invest and from where to trade. And it becomes a FDI decision, if a foreign location is chosen. It follows that, increasingly, what matters are the factors that make particular locations advantageous for particular activities, for both, domestic and foreign investors. This creates new opportunities and challenges for countries. Reduced obstacles to trade and FDI and the possibilities that they open up for TNCs to disperse production activities within integrated international production systems create new opportunities for countries. The challenge is to attract FDI and then to maximize the benefits associated with it in order to realize the opportunities arising from the new environment. For example, integrating production within corporate systems along efficiency-oriented lines means that firms fragment activities more closely — and narrowly — in accordance with the static comparative advantages of different (domestic and foreign) locations. The division of labour that results provides potential opportunities for countries to participate in production and trade associated with TNCs, specializing in segments of goods and services production for which they have a comparative advantage. Moreover, as firms fine-tune their search for locational advantages, countries with a broad range of capabilities have the opportunity to attract specialized activities in various industries. Many firms in developing countries, particularly in Asia, but also in Latin America, are already part of regionally or globally integrated production systems of TNCs or are linked to them through subcontracting or other arrangements, exporting parts, components and/or selected products to affiliates and parent companies. There are, of course, always risks associated with participation in the international division of labour. Vulnerability may increase as specialization becomes more narrow, especially when it is susceptible to technological change and locational reorientation (e.g., data-processing). Greater interconnectedness of FDI and trade also has potential implications for dynamic change and growth through technological upgrading and innovation in the countries attracting TNCs. As the international intra-firm division of labour within TNCs evolves, affiliates become focused on areas in which the local potential for innovation is greatest. Hence, there is a search for local sources of innovation in each affiliate, which can become part of a regional or global strategy of production and marketing. For developing countries, the extent to which the gains from participating in such integrated innovation within TNC systems are realized locally depends on the role assigned to local affiliates and on the extent to which this role is associated with networking with other firms (especially indigenous firms) in the same location, and hence becomes part of a wider system of technological and associated spillovers. Countries differ considerably in how they can act as centres of excellence for FDI in research-based products. A few developing countries have succeeded in becoming centres for the location of innovative activities of TNCs and become locked-into a dynamic process of technological upgrading. Others have not managed to attract FDI that carries technological spillovers and, therefore, have been locked-out. This is precisely where government policies become important in terms of creating the factors that make a particular location attractive for particular activities, or in exploring alternative (non-TNC related) avenues of dynamic upgrading. There may also be benefits to countries due to the accelerated transformation of the industrial structures of host and home countries which is the allied consequence of the integration of FDI and trade. In general, countries — developed and developing — tend to benefit in efficiency from a restructuring in favour of industries in which the country is comparatively advantaged (and in which integrating TNCs expand their local operations), and in dynamic terms from a greater focus on activities in those industries in which the country’s potential for innovation is greatest. For developing countries, the latter is particularly beneficial since foreign affiliates within those industries tend to develop greater capabilities as part of the regional or global strategies of their respective TNCs. Thus, these affiliates can make a greater contribution to local innovation through linkages and spillovers. However, the structural transformation that occurs because of opportunities created by integrated FDI and trade networks depends on local specificities. Many developing countries that have managed to attract FDI that is part of regionally or globally integrated production systems are involved in low-technology activities which have contributed to expanding and diversifying their economies, but which have limited consequences for technological upgrading. For a few, however, there has been more positive change. From a wider perspective, the benefits of closer FDI-trade interlinkages — whether for static efficiency, technological dynamism or industrial restructuring — are by no means evenly distributed between countries, in part because of the uneven distribution of FDI. In the short and medium-term, poorer countries that generally attract little FDI may have few opportunities to capture such gains and may indeed be further marginalized unless there are strong national and international efforts for development. As more countries build up the human-resource and infrastructure capabilities that TNCs seek, the scope for these countries to share in the benefits can be expected to increase. The gains of greater participation in the international division of labour are also accompanied by costs to particular groups within economies, both developed and developing — and more so when unemployment is high. Balancing the benefits against these costs poses a formidable challenge for policy makers. Integrated FDI and trade requires coordinated policies. The intertwining of FDI and trade presents new challenges for national policy makers. The need for coordinated policy approaches acquires greater importance with the emergence of integrated international production systems, as investment and trade flows are the life-blood of such systems. Transnational corporations internally integrate the trade and investment functions that most national governments still tend to view and address separately, sometimes creating a disjuncture between national policy instruments and integrated corporate transactions. National trade and FDI policies have typically evolved separately, frequently influenced by different goals, and administered by distinct, often loosely connected agencies. This historical and organizational separation is not suited to a world in which trade and FDI are closely interlinked. Inconsistent policies risk creating an environment in which trade and FDI policies may neutralize each other, or could even prove counterproductive. On the other hand, when formulated and implemented coherently, national trade and FDI policies become mutually reinforcing in support of national growth and development. Coordination can generate synergies that yield outcomes exceeding the expectations for separate policy choices. At the same time, policy coherence does not presuppose any particular overall policy approach (e.g., a liberal approach); it merely is a reflection of the fact that, since FDI and trade are inextricably intertwined, national policies on FDI and trade need to be coordinated. Since FDI and trade are both handmaidens of growth and development, it is important to understand the interlinkages between the two. The relationship between trade and FDI in a given product is characterized by a sequential process of internationalization... ....with associated trade and associated investment effects... ...and implications for countries’ trade. The world environment for trade and FDI is changing,... ...allowing firms greater choice of production locations and modalities of internationalization, making the internationalization sequence less important... ...and pushing TNCs to establish integrated international production systems,... ... within which FDI and trade flows are determined simultaneously. This creates new opportunities and challenges for countries. Integrated FDI and trade requires coordinated policies.